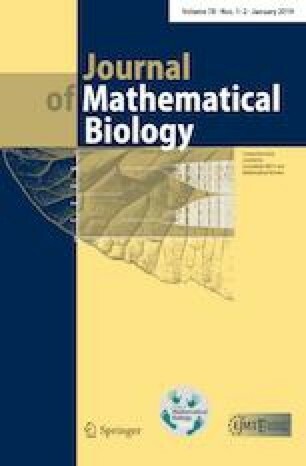 The Kirkpatrick–Barton model, well known to invasion biologists, is a pair of reaction–diffusion equations for the joint evolution of population density and the mean of a quantitative trait as functions of space and time. Here we prove the existence of two classes of coherent structures, namely “bounded trait mean differential” traveling waves and localized stationary solutions, using geometric singular perturbation theory. We also give numerical examples of these (when they appear to be stable) and of “unbounded trait mean differential” solutions. Further, we provide numerical evidence of bistability and hysteresis for this system, modeling an initially confined population that colonizes new territory when some biotic or abiotic conditions change, and remains in its enlarged range even when conditions change back. Our analytical and numerical results indicate that the dynamics of this system are more complicated than previously recognized, and help make sense of evolutionary range dynamics predicted by other models that build upon it and sometimes challenge its predictions. Research partially supported by National Science Foundation award DMS-1615126. This material is based upon work partially supported by the National Science Foundation under Grant No. DMS-1615126. J. R. M. thanks the anonymous reviewers of an earlier version of this paper.